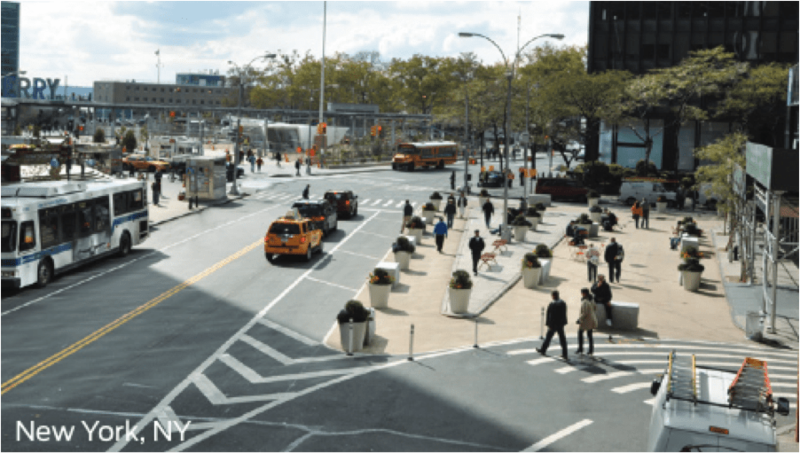 In a direct challenge to the long-standing authority of state DOTs to determine how transportation infrastructure gets designed, the National Association of City Transportation Officials (NACTO) yesterday launched its Urban Street Design Guide. NACTO’s Urban Bikeway Design Guide has already empowered cities around the country to embrace protected bike lanes and other innovative designs that the American Association of State Highway and Transportation Officials has shied away from in its engineering bible, known as the “green book.” The Federal Highway Administration has even endorsed NACTO’s guide, and the agency is currently drafting its own bicycle facilities guidance, which will likely fall somewhere in between. The Street Design Guide goes much further, giving engineering guidance on everything from crosswalks (zebra-striped, please, for greater visibility) to parklets (go ahead, usurp a few parking spots!) and from contra-flow bus lanes (bicycles optional) to slow zones (speed humps, tables, and cushions). As NYC DOT Commissioner and NACTO President Janette Sadik-Khan said, it’s a new DNA for city streets. Streets Are Public Spaces. They’re fundamental to public life, not just a corridor for transporting oneself from point A to point B. Great Streets Are Great for Businesses. Streets that encourage foot and bicycle traffic result in greater retail profits and higher home values. Streets Can Be Changed. Many city streets were designed 50 or 60 years ago, in an entirely different context with a different set of values and assumptions. Engineers can make big changes even while working “within the building envelope” of a street. Design for Safety. More than 34,000 people were killed in traffic crashes last year in the United States. Streets need to do a better job of ensuring the safety of people in cars, on foot, on bikes, window-shopping, playing hopscotch — you get the idea. Streets Are Ecosystems. Sustainable design elements like pervious pavements and shade trees help the built environment interact in a healthier way with the natural environment. Act Now! This may be the greatest contribution that NACTO and its president have made to design. You don’t have to wait for proposals to be approved and study commissions to review the concept. By using low-cost and removable materials, cities can test out new designs, helping people visualize changes and determine whether or not to make them permanent. After testing out a design with paint and planters, cities can redo it with concrete and steel. Sadik-Khan has done this in New York, notably starting the Times Square pedestrian makeover with little more than lawn chairs before committing to a permanent redesign that tore up the asphalt. When HUD Secretary Shaun Donovan spoke — approvingly — of NACTO’s “guerrilla tactics,” Sadik-Khan corrected him. They’re not guerrilla tactics, they’re design standards. I flipped through a lot of their recommendations and are very happy with them. Their bike design still ignores intersection safety for the most part, though; I’d prefer recommendations that take bikes into account at intersections. Designs that dump people on bikes into right-turn lanes isn’t a very good idea, in my experience. Hopefully a lot more of our cities here start to take these recommendations into consideration. It’s a great tool for citizens to bring to community meetings as well, no matter where they live. Does anyone know if this type of design has ever been implemented in the US? And what’s stopping us from getting it? I’ve lived in the Netherlands and these everyday intersections work great. That is precisely the design I am talking about. If there’s room at an intersection, I would love to see it tested over here. It makes riding a bike so much easier. So very true! And as the video points out, it doesn’t require any more extra space; it simply delineates and separates the tracks in a much better way. Yep. I remember this kind of design. It’s so much less nerve wracking to navigate. Ja! And I mean it’s great that our street standards are improving from Absolutely Deplorable For Anyone But Cars to Still Mostly Car-Centric With A Nod To Non-Cars, but what I don’t get is if we’re bothering to make improvements, why are we still aiming for second-rate? Of course I’m preaching to the choir here but I’m just curious on a policy level how we can get tried-and-true superior designs like the standard Dutch cycletrack intersection to happen here. In Chicago tomorrow and Friday there is a ThinkBike event. Something to do with the Dutch way of cycling, with planners from NL. I cannot go, unfortunately, but I hope it’s productive. In Chicago I’ve heard the DOT tends to be pretty apprehensive to some of their recommendations. I live in San Francisco, where it can take years to stripe a conventional Class II (the way Caltrans defines it that’s your standard US bike lane inexplicably between parked cars and moving traffic, despite the fact it doesn’t take up any more space to just put the bike lane between the parked cars and sidewalks) bike lane, much less something “radical” like a separated cycletrack intersection. I’ve looked around and it doesn’t appear there are any such similar events here in SF. Just to note in that picture above, there is now a bikeshare dock along the left side replacing about half of the planters. An even better way to protect a pedestrian area than the one-use concrete. While I can understand what supporters of this design had envisioned for safety, I don’t see how it can possibly ever work well on any road with a high volume of traffic and/or high speeds; and typically these are the only streets that get any bike infrastructure to begin with. It’s essentially asking drivers and cyclists to criss-cross paths when approaching an intersection, as if it’s so easy (and safe) to do. I wonder how many drivers realize they are suppose to be turning right next to the curb when the dashed lines are present. Based on my experience, not very many, if any at all. At $50 each for a hard-copy version of the complete guide and deliberate avoidance of providing any downloadable/free version (aside from scanning the chapters online in realtime), NACTO clearly intends this guide to become an ongoing source of revenue…. Oh, yes, thanks. I do remember reading that, but have there been anymore recent events/actions on that front? Excellent guide! Just curious, as an average citizen what can I/we do to get stuff like this to be taken seriously by our cities? Yeah, and at the very least it doesn’t seem like widespread transparency is a top priority. Building a town in Northwest Indiana. Have had a lot of attention (LRK, Todd Zimmerman, Dan Slone & Weaver/Sherman involved). 10 years in existence and having speed issues on urban standard street design. Neighbors want speed bumps. As Developer, need to respond. They NACTO Urban Street Design Guide is fully online at http://nacto.org/usdg and has been since at least November 2013 (the last time Archive.org scraped it).